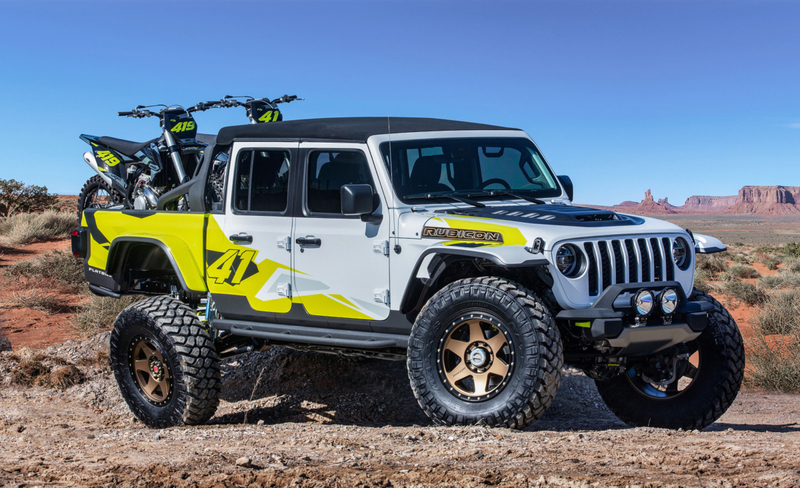 Jeep has revealed a number of custom-built concept vehicles at its annual Easter Jeep Safari currently taking place in Utah, US. 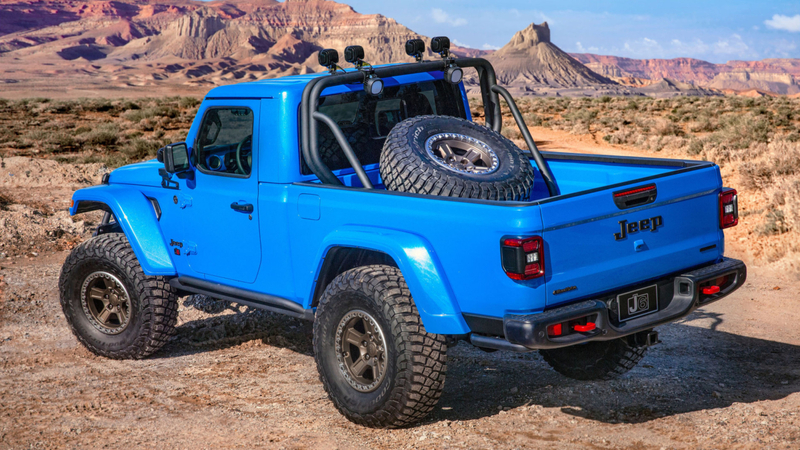 Among the vehicles to catch the eye is the Jeep J6 pick-up, one of six concept vehicles on show in conjunction with Mopar, the parts, service and customer care company within Fiat Chrysler Automobiles. 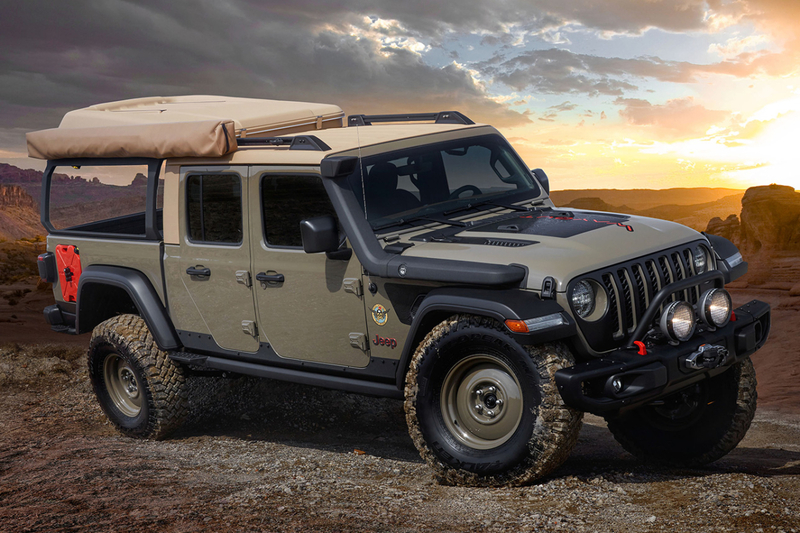 “The Jeep J6 is a Rubicon customised in a two-door configuration, maximising cargo space with a large, six-foot functional bed “box” area that is 12 inches longer than the standard Jeep Gladiator bed. “Mopar and the Jeep Design team reached back in time for the custom Metallic Brilliant Blue paint, a homage to the exterior look of the 1978 Jeep Honcho. The overall length of the J6 is 201 inches, while the wheelbase clocks in at 118.4 inches, matching the wheelbase of the current-generation Jeep Wrangler 4-door,” the group said. The upsized bed area is guarded by a prototype body-colour matching spray-in bedliner. 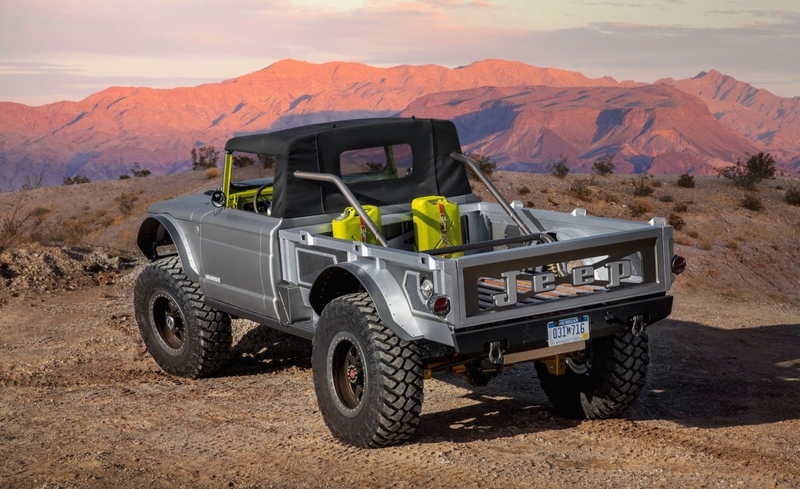 The custom truck includes a steel prototype sport/roll bar planted in the bed carrying a set of four, 5-inch Jeep Performance Parts LED lights, that shine at 4,800 lumens each. 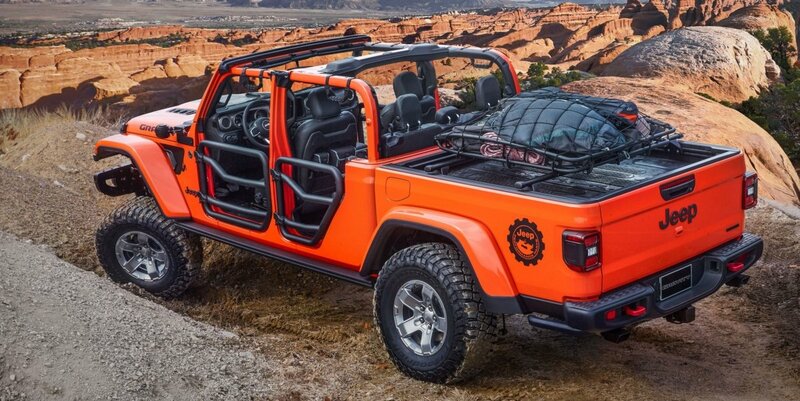 Jeep pointed out that the concept hard top is removable. Powering the J6 is Jeep’s 3.6-litre naturally-aspirated V6, getting up to 209 kW and 347 Nm. Power is provided to the Jeep M-715 Five-Quarter by a 6.2-litre supercharged “Hellcrate” HEMI V-8 engine which produces more than 700 horsepower. The Jeep Wayout concept is an overlanding vehicle that Jeep said takes advantage of the all-new Gladiator’s payload. 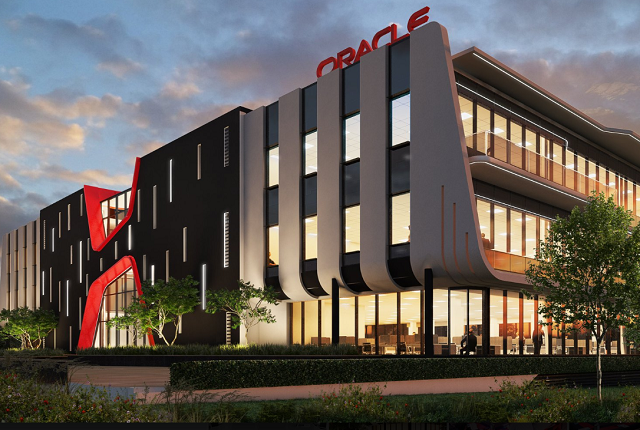 It is functional concept that showcases a full roof-top tent and custom, large sprawling canopy. The Jeep Wayout is powered by a 3.6-litre Pentastar V6 engine and mated to an eight-speed automatic transmission. 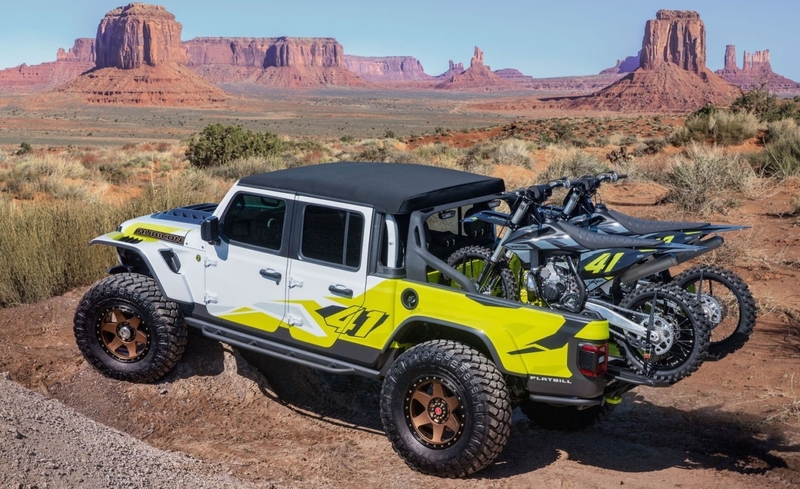 Designed with the desert lifestyle in mind, the Jeep Flatbill concept is another fun look at the all-new Gladiator, “mixed with the extreme thrills of the Motocross world – resulting in an unmistakable, loud and rowdy appearance that serves as the ultimate hauler for an array of toys”. The Jeep Flatbill is powered by the 3.6-litre Pentastar V6 engine with a cold-air Mopar intake and mated to an eight-speed automatic transmission. 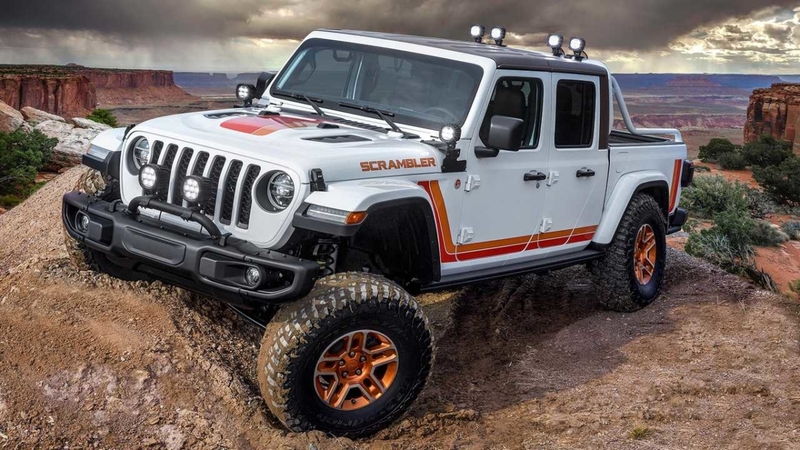 The Jeep JT Scrambler concept is a heritage-inspired remix, the car group said, carrying the throwback colour palette and graphics of the iconic CJ Scrambler crossed with a combination of available Jeep Performance Parts and conceptual touches. The 3.6-litre engine is augmented with a Mopar cold-air intake and cat-back exhaust. 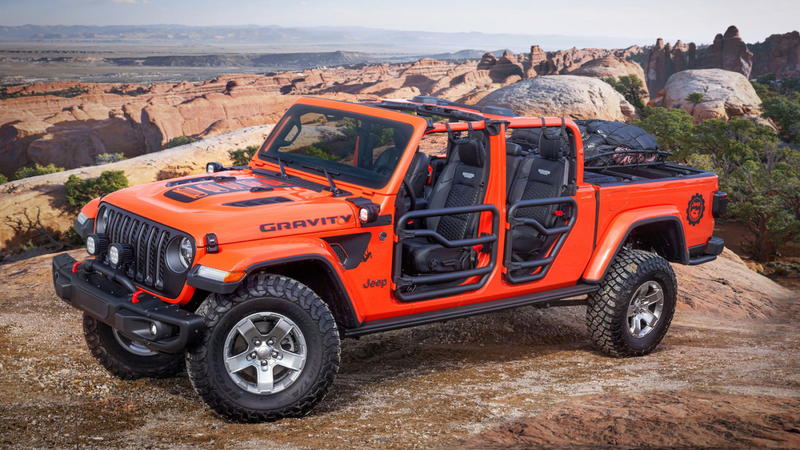 The Jeep Gladiator Gravity – Jeep Gladiator Rubicon – is colored in attention-grabbing Punk’N Metallic Orange. 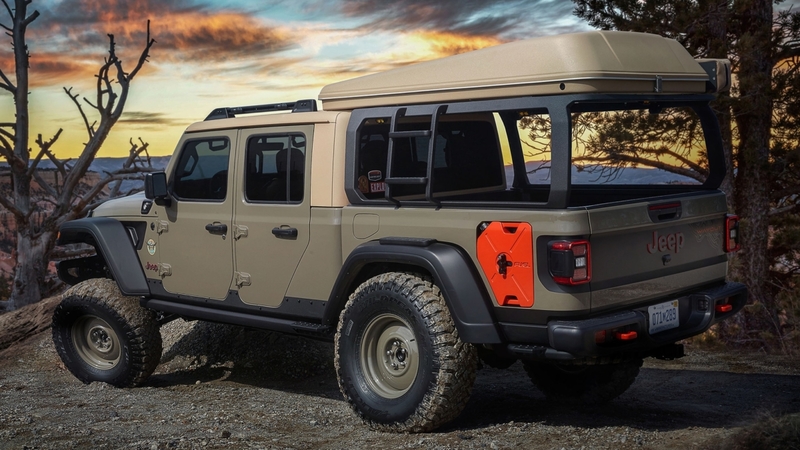 The open-air potential of the Jeep Gladiator is realized through Jeep Performance Parts 2-inch round steel tube doors, a mesh sunbonnet that provides cover while keeping the top-down feel, and tie-down straps that secure the windshield when lowered, the car maker noted.